The Super Bowl is coming! The Winter Games are coming! Use the hype of these games to improve comprehension at all levels. 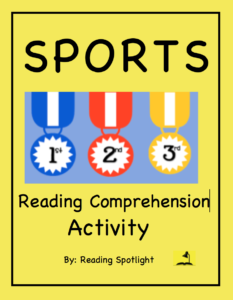 This photo/caption matching All Sports Comprehension Activity can be used for any sport and any level. Highly motivating for struggling readers, the learning center activity is simple, inexpensive, and effective! This FREE product includes clear instructions and forms, as well as paper medals to award. The Greatest Stars of the Winter Games.